Usain Bolt completed a Rio 2016 sprint double by winning the 200m as Jade Jones took Great Britain's gold-medal tally to 22 with taekwondo success. maican has one final chance to win gold in Friday's 4x100m relay final. Jones, meanwhile, beat Eva Calvo Gomez to win taekwondo's -57kg division. 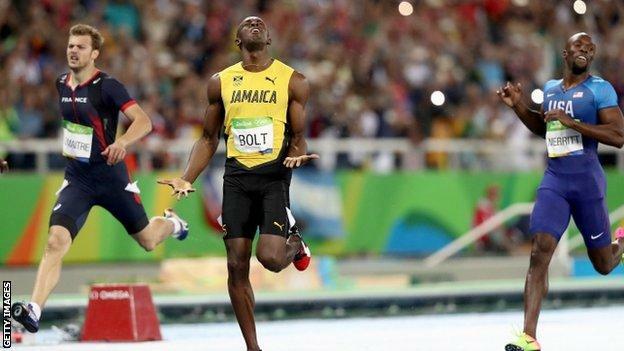 With three days remaining, Britain are just nine medals short of the record 65 they secured in London four years ago. They got off to a great start on day 13 as Alistair Brownlee and brother Jonny won gold and silver respectively in the triathlon, and Hannah Mills and Saskia Clark triumphed in the sailing. Elsewhere, Liam Heath and Jon Schofield won silver in the men's 200m kayak double, and Marcus Ellis and Chris Langridge took bronze in badminton's men's doubles. Nicola Adams reached the women's flyweight final as she attempts to become the first British boxer to retain an Olympic title for 92 years.